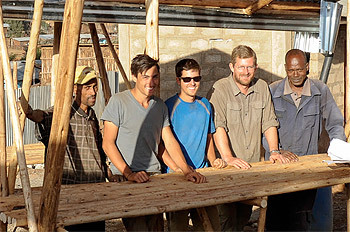 The University of Maryland Engineers Without Borders team in Ethiopia last winter. Alumnus Marvin F. Weissberg has created an endowment for the University of Maryland’s Engineers Without Borders (EWB) and Maryland Sustainability Engineers (MDSE) programs. The endowment will support the Marvin F. Weissberg EWB/MDSE Team, and will help fund a team project each year. Additionally, Weissberg’s gift will provide scholarship support to students who are actively involved in the EWB and MDSE programs. EWB is a national program that partners with developing communities abroad to improve quality of life through the implementation of environmentally and economically sustainable engineering projects while developing socially responsible engineering students. Teams of UMD students work within communities to ascertain needs and develop and implement engineering solutions. MDSE’s objectives and tactics are similar, but include domestic projects as well as international efforts. Weissberg is the founder and chairman of the board of Weissberg Corp., one of Washington, D.C.’s major commercial real estate development companies. The son of a tailor, Weissberg’s path has taken him far from his hometown of South Bronx. His parents moved to Washington, D.C., when he was in high school. After graduation, he began taking engineering courses, but left school to serve in the U.S. Army. The World War II veteran completed his degree in Civil Engineering at the University of Maryland in 1949. A strong believer in civic engagement, Weissberg established the Weissberg Foundation, a family foundation dedicated to alleviating human suffering and broadening cultural understanding. “This foundation has been a great experience not only for me but for my children and grandchildren,” says Weissberg, who is eager to instill his philosophy of giving back and helping others in his family of three children and their spouses as well as his six grandchildren. Weissberg is a great admirer of Maryland’s EWB Chapter and its campus-initiated MDSE program. Weissberg and his son-in-law Stuart Martin ’00, met with students and faculty involved in the EWB program, and were impressed with the dedication and commitment demonstrated by all the participants. To learn more about Engineers Without Borders, visit: www.ewb.umd.edu.